Your close up magic case contains all the tools of the trade for being a magician. The close up magic case or bag contains your complete act, ready to take with you to each and every magic gig. As well as all the props for your magic tricks, a good close up magic case should have a range of emergency items ready for the unexpected problems that face any magician working in the real world. There are two main schools of thought when it comes to a close up magic case. Some magicians like to carry all the props for every magic trick they know. They take a massive magic case with them to each gig so they can perform any magic tricks they fancy, whenever the urge hits them. This behavior is most common with less experienced magicians. They fear running out of material, so can’t resist adding every new magic trick they practice into their case. They may be the first to admit that most of the items in their case never get performed. However, the thought of leaving them at home fills them with panic. The other type of magician takes only a few items to each gig. They pack only their ACT and the items needed to perform those core close up magic tricks. Magicians who pack lightly, tend to use scripting more, and organize their magic tricks into working sets. They add a new magic trick to their case with immense care, often carrying just one or two new tricks for a while, then removing them if they fail to be performed regularly. Now’s the time to give your close up magic case a good sort out. Take out all the rubbish. Strip out all the magic tricks you are carrying around and never performing. Make your close up magic case a lean, mean magic machine. Really useful items for a magicians close up case. Instead of all that clutter, use the space to add in some essential emergency items into your close up magic case. You can never have enough Sharpie pens. The last thing you want is to hand a pen to a spectator and get a dried up hard to read signature on their card. Carry some spares and you can lose the ‘where’s my sharpie’ paranoia. Popped a trouser button? Caught your jacket and ripped it? Clip broken on your magicians pull? If one of these hasn’t happened to you yet, don’t feel too smug. Sooner or later, something will go wrong in the clothing department, and you will throw your hands in the air and thank the cosmos that you added a safety pin into your case. It’s like a puncture repair kit for magicians. A little strip of black duct tape can hold together a rip in your trousers, secure a prop when your wrist band fails, Hold together a shirt if a button is lost. Secure your close up magic case in an emergency and stick a sign to a door. 1001 uses and zero effort to pop a roll into your close up magic case. The life of professional close up magicians is one of petrol station sandwiches and coffee as close friends. These buddies love to leave their mark of friendship on your tie whenever possible. Roll up a spare tie and pop it in your case. It’s better to have it and not need it, than need it and not have it. Pick a large one, and leave it in your case. That way you have emergency money for taxis, petrol station snacks and parking fee’s. Keep it folded inside a thumb tip. If you don’t spend it, you can always use it for a magic trick. Remember that puddle you landed in on the way to the main doors of the gig? The muddy lawn you had to cross to get to the marque? A small travel shoe polish is invaluable. Rightly or wrongly, people DO judge you by the state of your shoes. Add one of these to your close up case and sooner or later you will be emailing us to thank us for the suggestion. We recommend one of these to every magician that takes on personal tuition at the shop. It sounds silly, but magicians actually do come back to thank us for suggesting it. Coffee at the gig, a plate from the buffet, half a bottle of scotch in the toilets (Joke), all become part of your close up magic presentation, unless you pop in a mint before you start performing. Make sure you have some in your close up magic case. Include some finger nail cutters in your bag while your thinking about personal grooming. Long or dirty nails can creep up on you. Seeing the nail cutters in your case, will remind you to check that your nails look good. 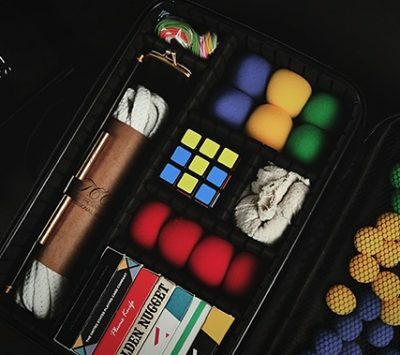 Those are the essential items we recommend that you add to your close up magic case. Go through your case or bag right now and dump all the stuff you are carrying around to every magic gig, but never using. All that stuff is just weighing you down, physically and psychologically. Use the extra space to include some emergency items. I always carry my basic routine (chop cup, some card effects, a thumb-tip etc), 2 spare decks of cards, an invisible deck, two sharpies, business cards and a mousetrap! That way I’ve got spare cards. Spare sharpies. And two “go-to” effects. My advice is to cut out the clutter but always carry 2 go to effects in case something goes wrong! Lint rollers are good for dark shirts. Copy of your Public Liability Insurance can be handy in case venue asks for it. Phone charger. Plus tricks! My case has LOTS AND LOTS of decks of cards. Forty or more, all brand new, still cello-wrapped. It likely has a lot to do with mostly doing hospital work – I give away a pack to each of my spectator/patients! It’s not only a good way for them to pass the time besides staring at a TV screen, it’s a good idea to prevent a potential vector for spreading germs. Most of the tricks I perform use an ungimmicked deck, but I carry a few of those as well – maybe a half-dozen different types. They make great backup tricks in case I have the misfortune of having a repeat customer – a recurring patient. The Lint Roller was an excellent suggestion, I also carry a pet fur removal brush, the type that picks up fur in one direction and releases it by brushing in the other direction. This is great for cleaning large or very dirty areas, and it also is good for sprucing up your backdrop cloth. Mine is flat so it packs small. I take a small case with office supplies, pens, pencils, post-it notes, etc. Also a travel sewing kit and finger nail clippers. Spare batteries are good too.